We had Amazing time, highly recommended tour and we had awesome driver Ravi. Our tour guide very accomodating and professional with his work. We had only one day to visit Jaipur and this tour was amazing. It delivered a maximum of historical sites of Jaipur in one day. Our driver Brijesh arrived in time in the early morning and was excellent in the driving in the way to Jaipur which was full of traffic. The car was very comfortable and clean Toyota. After 4 hours driving in Jaipur we met our guide Ashok, who was very happy, funny guy. He was with us the whole day and spoke perfect English sometimes very quickly but we could understand him. We managed to do everything from our list and we asked our guide to take us to elephant farm for riding on the elephant. And this was great experience for all of us. You should include this activity in your tour. It was memorable and enjoyable day! Pick up from Delhi was great, good driver; car had air con and wifi. Met guide at Amber, he was v.knowledgable. Review would have higher rating were I not forced into a Jaipur rug store at end of tour and hard sold to for circa 1 hour then pestered to review. Cannot recommend based on these ill-ethics. 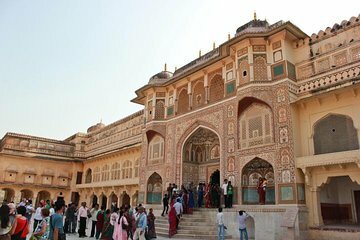 My wife and I had only one day to visit Jaipur, so this tour was perfect for us! A private driver, who was with us throughout the trip, has picked us up from our hotel right on time at 6am. The driver was excellent, very accurate and careful his name is DK SHARMA. The car was new one of the new Toyotas if I remember correctly and very clean. The drive to Jaipur was about 4h and we arrived around 10am. We've got very lucky with the guide - ASHOK KUMAR SHARMA, who was very engaging, spoke perfect English and was with us the whole day in Jaipur. We managed to see everything from our list, had a nice lunch and visited the rug workshop, where we've got a fantastic handmade rug for our home! The drive back was a bit hectic because of the traffic, but since we had a complimentary Wi-Fi in the car that wasnt a problem. Overall a great experience, would do this again! If you will get the same guide I am sure you will have a great experience! Also, try to stay for longer in Jaipur this is the most beautiful place we visited and has lots to offer in comparison to Agra. Good luck! After 5 stressful days in Delhi and taking tours through other agencies, this was a wonderful surprise. My driver Ravi drove 4 hours to pick me up at 6am from my hotel. In Jaipur, I met my guide Ashok Sharma. He was informative and fun. Best day in India by far. Hated saying goodbye to them.